Taking care of the laundry for an entire family can be a huge, and overwhelming, task. Luckily, even your littlest of helpers can participate in sharing the laundry “load”. This laundry guide will help you know what jobs and tasks your family members can help with, through an ages & stages guide to laundry! This post is sponsored by Tide. All opinions are my own. Little ones are eager to help around the house. 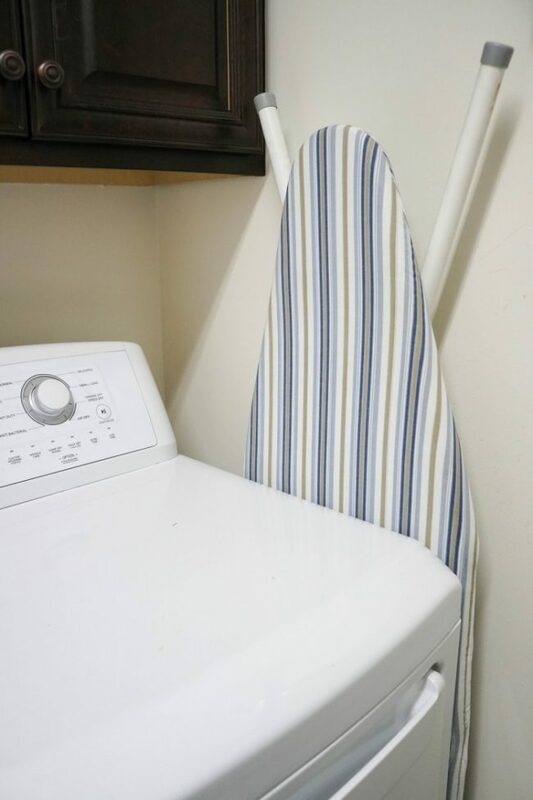 You can get them started in the laundry room by letting them help grab the clean, dry clothes from the dryer while you’re unloading the current load. 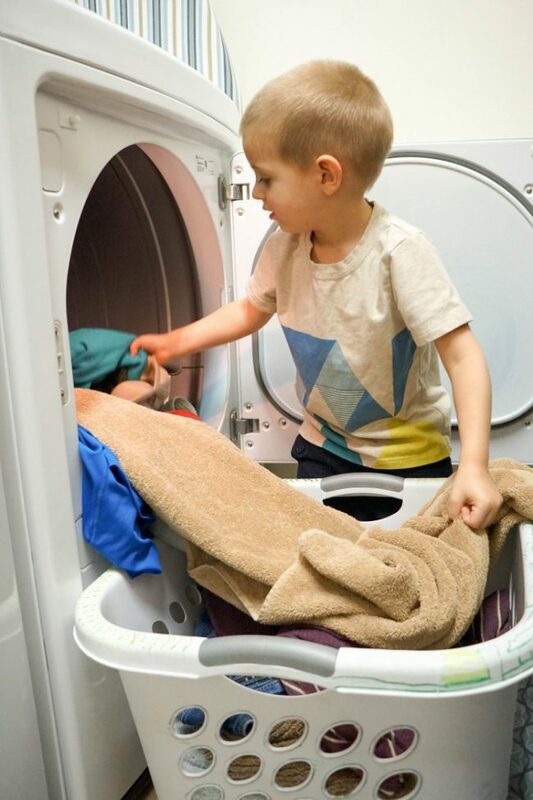 The 2-3 year olds won’t be able to reach the back of the dryer, and shouldn’t try, but that can help by reaching the clothes that miss the basket and the ones up front. Be especially mindful of your little children, as there are lots of dangers you may not think about – you can let them help, because they’re always underfoot, but be sure to keep your laundry products up high, out of reach, and out of sight of young children. At this preschool age, children are learning about colors and shapes! Put their new skills to work by giving them small batches of socks to match. They can find the matches while you’re busy folding the rest of the load. Then, roll or fold the matching pairs and be sure to praise their matching skills! 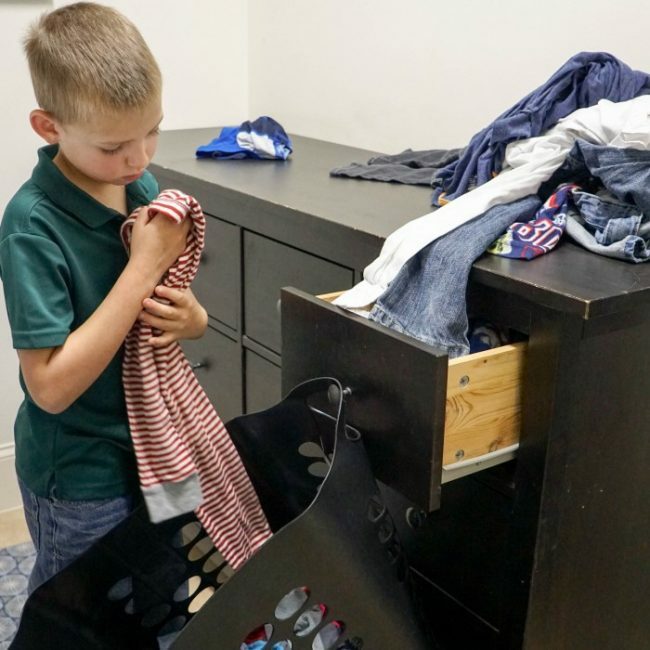 Early elementary aged children can start taking responsibility for putting their laundry away in their rooms and dressers. They can also help by gathering dirty laundry and bringing it down on washing day as well tidying up loose laundry around their rooms. 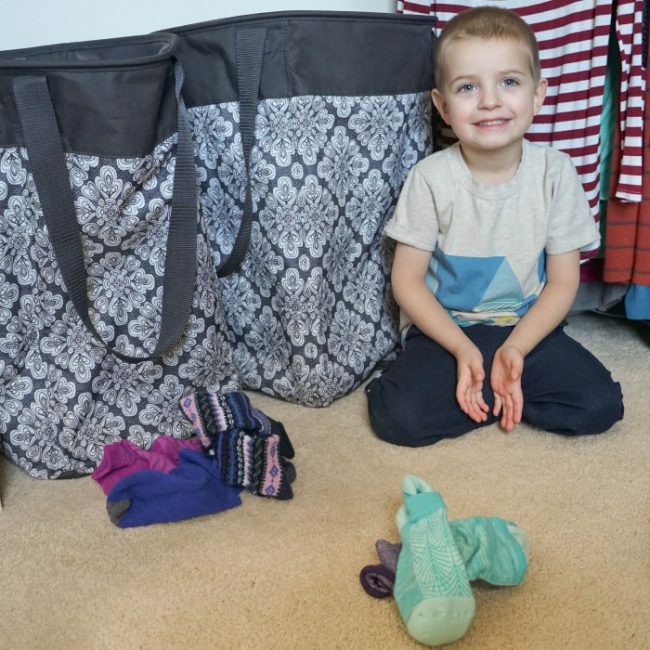 Make laundry fun for kids this age by letting them make “baskets” as they toss their laundry into their dirty clothes hamper when it’s time to pick up the dirty clothes. To keep piles neat and tidy, hand over a small pile of folded clothes that all go in a specific drawer. A short stack of tops all meant for their middle drawer will be much more likely to make it to the right spot than a towering stack that needs extra sorting once it makes it to their bedroom. Around 3rd grade, kids can start taking on the responsibility for sorting the clothing. You can start teaching them sorting by giving them two separate hampers for darks and lights. Have them double check their sorting when it’s time to bring down their laundry baskets to make your job easier. 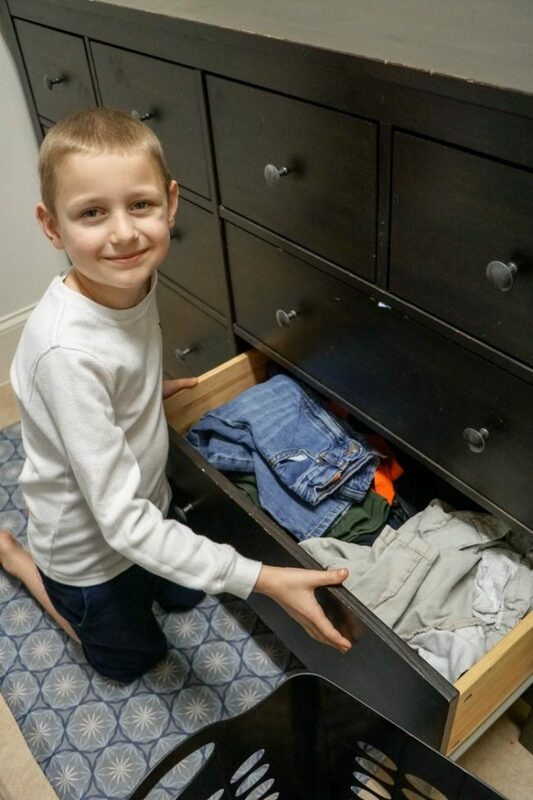 At this age, your child can also start helping to sort out the clean laundry piles, finding their own clothes from the piles and sorting out which family member the other clothing belongs to. Make it a challenge to see if they can beat mom sorting a basket of laundry. As your child reaches those tween years, they can start to manage folding and/or hanging their own laundry. Send them upstairs with their laundry basket full of clean laundry and let them take over the folding, hanging, sorting, and putting away of all their laundry. It may have taken you a decade to show them how to put away their laundry, but it’s finally paying off! 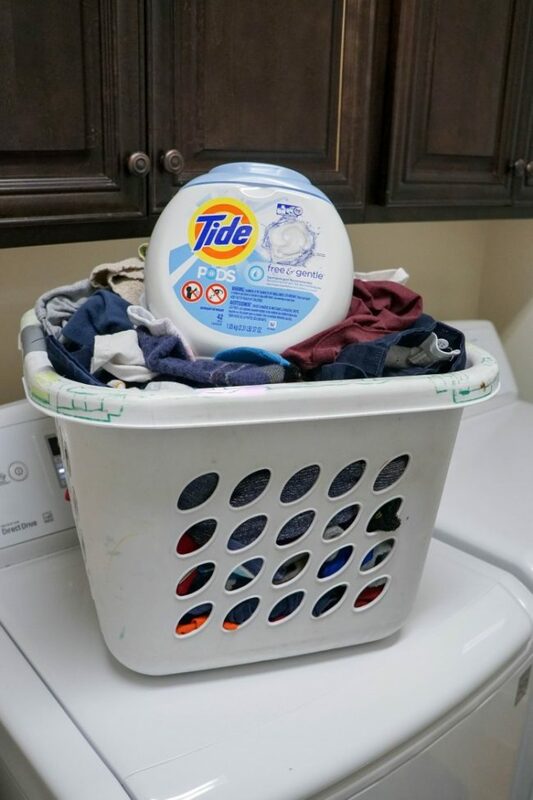 As they edge into the teenage years, let them start being responsible for transferring the washed clothes to the dryer and the clean clothes from the dryer into laundry baskets. You can also start teaching your child about the different cycles and how to select the best one for their laundry needs. Be mindful that laundry products are not designed for young children and can pose a safety risk. Be sure to teach your new teen the importance of keeping laundry products put away safely. That means, teaching your child not to leave the products piled up on top of the dryer, but instead in a closed cabinet, high and out of reach of younger children. Around age 14, you can begin teaching your child how to treat different stains and the importance of tackling stains right away. It’s about this age when they’ll really start caring about the way they dress and their appearance, so these lessons will be aptly timed and be something they will want to learn. Teach them how to read the labels and understand how to treat different clothing. Finally, by sweet 16 your child should be able to handle all their own laundry problems. The last important laundry lessons to teach them is to care for especially delicate laundry. Before you know it, they’ll be off on their own taking care of their own laundry problems. You can also teach them, with supervision, how to use an iron and other wrinkle treatments such as pulling clothes out of the dryer as soon as the load is complete or using a wrinkle treatment spray to smooth out unwanted wrinkles. It’s amazing when the kids can help you tackle the laundry chore. But with the extra time they’ll be spending in the laundry room, you need to make sure you follow safety precautions to keep your family safe! There are three really simple things you can do to improve safety in your laundry room. 1. Keep Them Up – Store all your laundry products up high and out of reach of children, just like you would with many of your other household items. Choose a spot in your laundry room where you can access the products when needed, but that will be out of sight and out of reach for kids. This is so easy to remember to do, if you are conscious of why it’s important. Don’t leave out your laundry products on top of the washer or dryer or low cabinets where the kids might be able to access them. Take those few extra seconds it takes to ensure everything is put away. It will keep your laundry room tidy and give you a safe environment where you children can help with the laundry chores. 2. Keep Them Closed – Securely close laundry products by replacing the lids and securing any safety measures built into the packaging. Choosing Tide PODs gives you the extra layer of security with the Child-Guard™ Pack and Child-Guard™ Tub. This smart packaging makes it hard for little hands to open the packs while still being easy for adults. The Child-Guard™ Pack requires users to engage a notch to open the bag and the Child-Guard™ Tub requires squeezing and turning the lid to open, similar to a child-proof medicine bottle. Use only the original containers and packaging for storing your laundry products. 3. 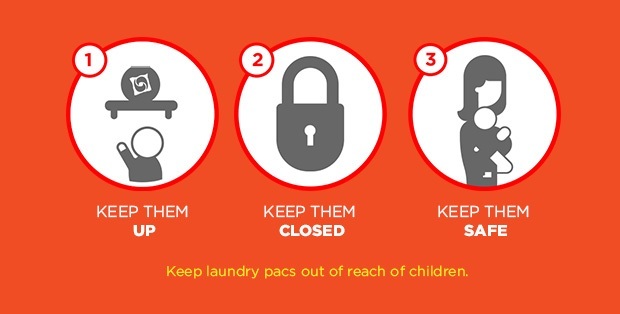 Keep Them Safe – Keep your eyes on your children when they are in, around, or near your laundry room. You can keep your laundry room door shut and securely closed with a safety knob to protect your little ones. You can tackle laundry tasks that your children aren’t old enough to help with during their downtime (such as naps, bedtime, or while they are at school). Do whatever might be necessary in your own home to keep your children safe with these 3 simple and easy to remember steps. Keep them up. Keep them closed. Keep them safe. 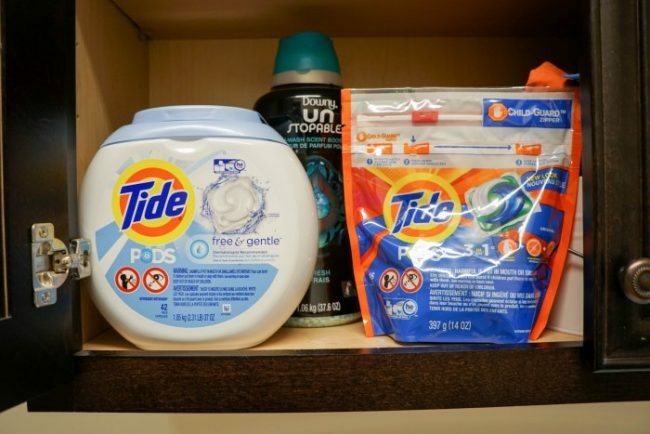 Visit tide.com/safety for more helpful tips for laundry room safety. One way to improve safety in the laundry room is being aware of what different laundry tasks your child may be capable of at their age. You can print and keep a copy of this Laundry Chores by Age cheat sheet guide to help you raise responsible children while keeping them safe. 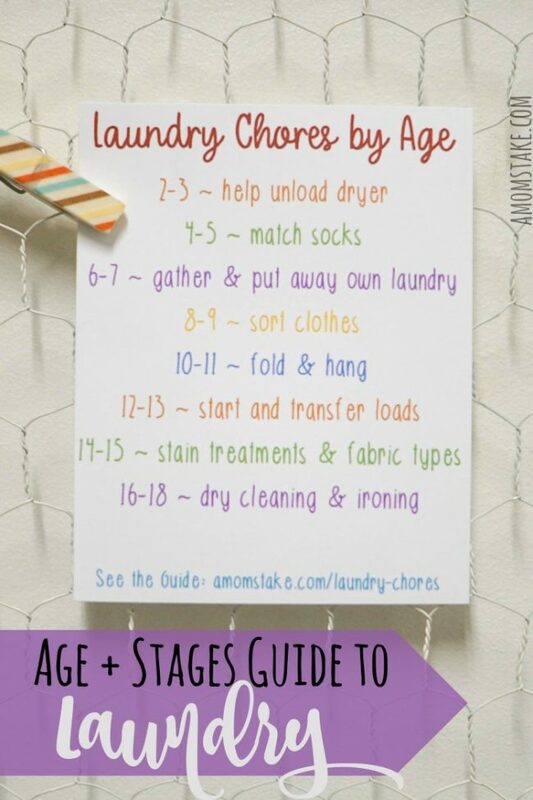 Grab a printable copy of the laundry by the ages cheat sheet and hang it in your laundry room so it’s easy to find and refer to, as needed! What laundry chores do your kids helped with? This is a great resource to have. I need to get my kids more involved in doing laundry. This is a good list to have. Teaching children how to laundry is so important. Oh boy thank you! I will be using these chores ASAP for my kids! I love this handy list! Printing it out to show my nine-year-old who should most definitely be helping more with the laundry – instead my toddler loves to put the clothes in drawers. This is awesome! My kids love helping with laundry chores when they were little. My son is five and actually really likes to help with laundry. I will have to try some of your suggestions. It can sometimes be hard deciding what chores your child should be doing at what age. This is a good guide for a basic chore of laundry. I know I don’t like doing it by myself so any help is appreciated! Boy I really need to use this chart. I have 6 kids and I feel like all I do is laundry. I know I am a control freak but I think it’s time to start sharing some of the responsibility. My kids have started helping me to put clothes away. They really are not into it though but they try their best! I love this. Especially since I decided that this summer, my son will learn how to do a lot of things around the house! It’s time! I love ‘match socks’ for 4-5- I never thought about it but that’s a genius chore for a child in that age! My mom had me on laundry duty early, back in the days when we had a shared laundry room in a condominium complex! We are definitely in the middle of doing this ourselves. I am in transition with our youngest kiddo. He is getting to the age that he is now able to do his own loads. 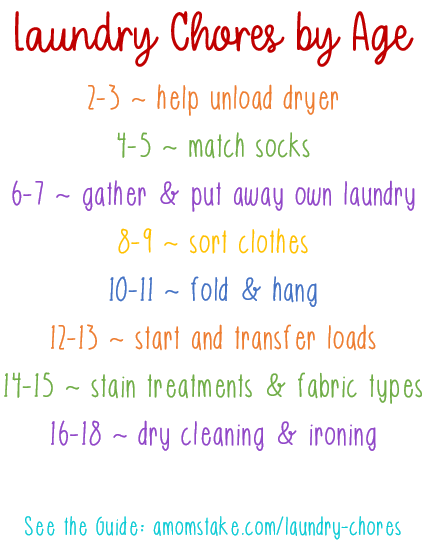 These are some really good ones and those laundry habits will help a lot as they start to become independent. The stain treatment and ironing skills are so important. I love this post because I know kids can help with something around the house. We expect our kids to sort and fold laundry and they are a lot older than your guide starts at. They have not started a laundry yet but that is next. Teaching our Children life skills is really important and I feel like our kids have to be ready to do the tasks themselves at some point. I think it is really important as well though, that we make sure they are safely participating. I think it is really super important to involve our Children in daily tasks like laundry. 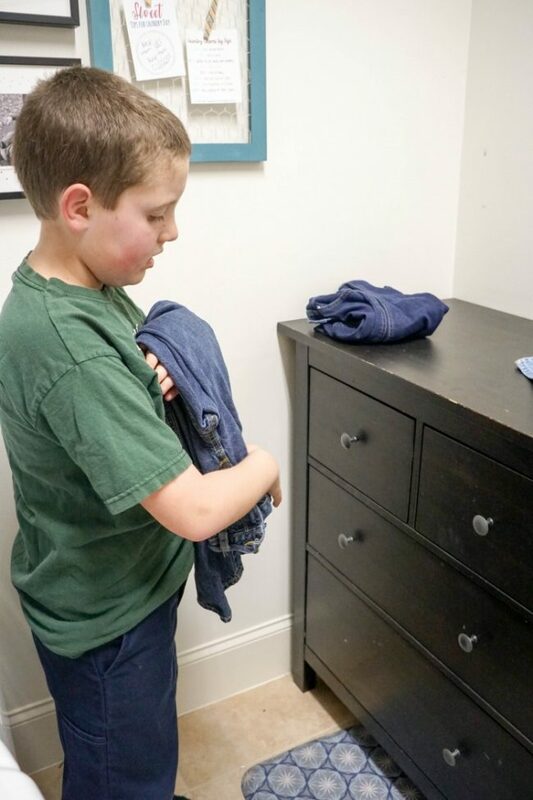 Even if they can’t do the laundry independently, it is really great for them to learn different parts of the process so that they can get really good at it for when they get older. This is an excellent resource. We all want our kids to help us with household duties like laundry, but in laundry’s case, there are only certain things certain ages can do. Love this.